Young Emma Wagner chafes at the constraints of Bethel colony, an 1850s religious community in Missouri that is determined to remain untainted by the concerns of the world. A passionate and independent thinker, she resents the limitations placed on women, who are expected to serve in quiet submission. In a community where dissent of any form is discouraged, Emma finds it difficult to rein in her tongue-and often doesn't even try to do so, fueling the animosity between her and the colony's charismatic and increasingly autocratic leader, Wilhelm Keil. Eventually Emma and her husband, Christian, are sent along with eight other men to scout out a new location in the northwest where the Bethelites can prepare to await "the last days." Christian believes they've found the ideal situation in Washington territory, but when Keil arrives with the rest of the community, he rejects Christian's choice in favor of moving to Oregon. Emma pushes her husband to take this opportunity to break away from the group, but her longed-for influence brings unexpected consequences. As she seeks a refuge for her wounded faith, she learns that her passionate nature can be her greatest strength-if she can harness it effectively. 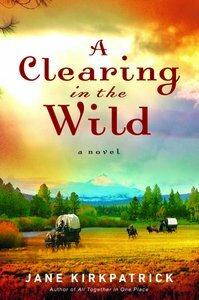 About "A Clearing in the Wild (#01 in Change And Cherish Historical Series)"
A Community Searching for Refuge, ^A Woman Finding Her Voice ^The people of Bethel, Missouri, seek to live with simplicity and generosity, existing in the world of the 1850s but remaining set apart from its distractions and vanities. Rather than finding peace in this would-be utopia, spirited young Emma Wagner chafes at the constraints of a culture that values conformity over independent thought, especially in women. Some say that love’s enough to stave off suffering and loss, but I would disagree. Quietly, of course. Words of dissent aren’t welcome in our colony, especially words from women. I should have learned these lessons–about dissent and love–early on before I turned eighteen. But teachings about spirit and kinship require repetition before becoming threads strong enough to weave into life’s fabric, strong enough to overcome the weaker strains of human nature. It was a strength I found I’d need one day to face what love could not stave off. But on that Christmas morning in Bethel, Missouri, 1851, celebrating as we had for a decade or more with the festivities beginning at 4:00 a.m., a time set by our leader, love seemed enough; love was the thread that held the pearls of present joy. It was young love, a first love, and it warmed. Never mind that the warmth came from the fireplace heat lifting against my crinoline, so for a moment I could pretend I wore the wire hoop of fashion. Instead of something stylish, I wore a dress so simple it could have been a flannel sheet, so common it might belong to any of the other dozen girls my age whose voices I could hear rising in the distance, the women’s choir already echoing their joy within our Bethel church. Winter snows and the drafts that plagued my parents’ loft often chilled me and my sisters. But here, on this occasion, love and light and music and my family bound me into warmth. Candle heat shimmered against the tiny bells of the Schellenbaum, the symbol of allegiance my father carried in the church on such special occasions. The musical instrument’s origin was Turkish, my father told me, and militaristic, too, a strange thing I always thought for us German immigrants to carry forth at times of celebration. The musical instrument reminded me of an iron weather vane on top of one of the colony’s grain barns, rising with an eagle at the peak, its talons grasping an iron ball. Beneath, a crescent held fourteen bells, alternating large and small, dangling over yet another black orb with a single row of bells circling beneath it. A final ring of tiny bells hovered above the stand my father carried this early morning. As a longtime colonist, he walked worshipfully toward the Tannenbaum sparkling with star candles placed there by the parade of the youngest colony girls. My father’s usual smiling face wore solemn as his heavy boots took him forward like a funeral dirge, easing along the wide aisle that divided men from women, fathers from daughters, and mothers from sons even while we faced one another, men looking at women and we gazing back. All one thousand members of the Bethel Colony attended. The women’s chorus ended, and I heard the rustle of their skirts like the quiet turning of pages of a book as they nestled down onto the benches with the other seated women. Later, the band would play festive tunes, and we’d sing and dance and give the younger children gifts of nuts and apples, and the men might taste the distillery’s nectar of whiskey or wine, though nothing to excess, before heading home to open gifts with family. We began the Christmas celebration assembled in the church built of bricks we colonists made ourselves. We gathered in the dark, the tree candles and the fire glow and our own virgin lanterns lighting up the walnut-paneled room as we prepared to hear Father Keil–as my father called him–preach of love, of shared blessings, of living both the Golden and the Diamond Rule. He’d speak of loyalty to our Lord, to one another, and ultimately to him, symbolized on this day by the carrying of the Schellenbaum and the music of its bells across the red-tiled floor. As my father passed in front of me, I spied my older brother, Jonathan, my brother who resembles me. He, too, is small and slender with eyes like walnuts framed by thick brown eyebrows set inside a heart-shaped face. I used to tease my brother about his chipmunk cheeks until the day I overheard Helena Giesy say, “Emma Giesy and her brother look like twins, though Jonathan is two years older. Such puffed up cheeks they share,” she said. Our rosy cheeks bind us. Jonathan held his lower lip with his teeth, then raised his eyebrows, letting his eyes move with deliberateness toward the front and the tall, dark-haired man standing next to Father Keil. Now my heart skipped. Jonathan lifted his chin, grinned. My face grew warm. I never should have told him. At least I kept the secret from the little ones, though Catherine at fifteen would claim she was adult enough to know, but she’d have clucked her tongue at me for even thinking in the way I did. David, Johanna, Louisa, and William, well, they’d have blabbed and babbled without knowing what they really said. The bells tinkled and the band struck up notes. Later, if the weather held, the band would move out onto the platform around the church steeple and play Hark! the Herald Angels Sing, so loudly that perhaps the ears of those in Shelbina thirteen miles south would be awakened and our colony would intrude on them, but in a glorious way. We were meant to be set apart by our commitment to the common fund, Father Keil told us, and yet to serve. Lately, Shelbina and its railroad threatened us. My father said Father Keil grew worried that Shelbina’s life might lure young men away. Father Keil would do his best to keep Bethel’s sons loyal, separated, even though he said our passion should be to bring others to our fold, save others from God’s planned destruction of our world, give to those in need, especially to widows and their children. to luxury over faith. Neighbors. The people of Shelbina were good neighbors, I always thought. They bought our gloves, our wine, and our corn whiskey. But few of us really knew them. We had no way of knowing if they’d heard about the coming destruction or if they suffered from worries and woes. Our religious colony cherished lives of simplicity, sharing frugal wealth in common, all needs of colonists met, silencing desire for unnecessary passions. Whatever cash we earned went to the common purse. If we needed cash for some outside purchase, we went to that same coffer. Whatever we needed from the colony’s yield, we simply walked to the storehouse to secure it. My mother said it eased all worry about the future; I saw it as one more person to have to convince to let loose the purse strings. We colonists were different from those around us in Missouri; we were an island of our own. We worked to stay unsullied by the larger distractions of the world that Shelbina symbolized even while we attempted to bring others into the joys of our colony’s ways. Only the strongest of us could reach outside and yet stay faithful, Father Keil said. I smoothed my skirt and felt the ruffle. The brass horns pierced the room, announcing Father Keil’s beginning words. Angels’ trumpets. Music is the perfect way to celebrate a glorious occasion, I’ve always thought. Jonathan played in the men’s band. Not me. Not girls, not young women. Our music came from our voices raised in the choir or while beating rugs or dying wool or serving meals to men. I couldn’t carry a tune in a candlestick holder, something else that made me different. But separation from the women’s choir or the brass instruments of music did not keep me from the joy of this day especially. My father set the Schellenbaum on its stand, then took his place across from us, sliding next to my brothers, who then wiggled on down the bench, a place they always sat. We’d been a part of this colony for as long as I could remember. My father had been one of three scouts sent out from Pennsylvania by our leader to find a “place of separation” in the unknown territories, far from the larger world. I was five years old when we moved with other German families discouraged by the changes in George Rapp’s colony at Harmony, Pennsylvania. We seceded first to Phillipsburg, then into Indiana, then into Shelby County, Missouri, where our leader imagined Bethel into being. It is a joyous place, Bethel, even though my father says many will be summoned in the morning to discuss reasons we might have to leave again. Change never troubled me. I welcome change, newness, though I work to keep my pride in check about it. Pride is an evil thing, our leader tells us. We must not envy, must not lust, must not covet. So no one knows I’ve stitched a ruffle to my crinoline. It is a harmless vanity easily removed but one that warms my spirit knowing it is there, unique on this winter morning as crisp as a hot-ironed crease. I gaze without envy along the row of plain and simple wool dresses of Bethel’s sisters on the benches. “But he also said it’s ‘better to marry than to burn,’ ” I challenged as I pulled on gloves made by Bethel factory workers. I could see my breath through the cold of our large house. I licked my fingers, then flattened William’s cowlick as he sped out the door. “Ach, Emma!” my mother chastened. “How you talk. Young Father Keil married before he came to know the Lord as he knows him now.” Her hands shooed me out the door toward the rest of the family. “He’s been a colony leader for many years, and his wife Louisa still has diapers to change,” I said, walking backward to keep chatting with my mother. My father held a lantern so we could see to walk to the church on the crunching snow, and he used it to signal me to turn about, gather up my younger brothers and sisters. “Wiser now he is, so he shares his wisdom with us, and we must listen,” my mother finished. “Who is wiser?” my father said as we joined him beneath the stars. “You,” my mother offered, taking his arm. I didn’t pursue the subject, but my disagreement with her and with our leader’s view gave me yet another reason to be joyful about my unseen ruffle. After all, isn’t part of wisdom thinking on one’s own, doing not what everyone else does but making distinctive marks, as distinctive as…as a Turkish instrument carried by a German man. Now we sat and listened to the bells of the Schellenbaum tinkle at this early hour service. Surely our leader didn’t think young men and women would forgo marriage or families for the sake of the colony? How would it grow? Would he rely on new conversions of men going with courage into the outside world, men too strong to be lured into the world’s ways? The tall man standing next to our leader moved to center the Schellenbaum on its stand beside the altar. My heart pounded with anticipation. He was my father’s good friend, our leader’s emissary most recently into Kentucky and the Carolinas. His name was Christian Giesy, and it was he I hoped to marry, though I wasn’t sure if he even knew my name. Christian Giesy. I prayed I’d aged enough that he might see me this Christmas morning as a young woman and not just a snippet of thread tethered to the weaving of my parents. He did not look my way but instead stared off as though he saw a glorious place somewhere far beyond this room, his eyes as shining as the lantern light flashed against the Schellenbaum. I swallowed. Perhaps he too believed as our leader did, that the finest way to honor God meant remaining celibate and unmarried. I pitched away that disappointing thought. Our leader raised his voice, large before us. Even errant thoughts of mine were pulled into the cymbal clang of his call to worship. His eyes were deep pools of churning water that nearly frothed with intensity and yet a kind of joy. We young women stopped shuffling our slippers. Men muffled their coughs. Mothers whispered quietly to their children, “Be silent, now.” His oldest son, Willie, gazed up at his father as though he were a saint. Only the sizzle of candle wax and the fire’s roar and the occasional tinkle of the Schellenbaum bells moved by the fire’s draft interrupted our leader’s words as he drew our faces toward him, toward the words my parents first heard in Pennsylvania, words that took us all in and changed our very lives. Fire burned inside the brick church, but it didn’t stave off the chill. We remained awake in the cold and with his words. When he raised his voice, a mesmerizing sound echoed words I’d heard so often as a child from him and then from my own father, too, who preached, though without the fervor of our leader. I didn’t need to pay attention now. But I willed myself to keep staring at him, to now let my eyes wander onto Christian Giesy. A tinsmith, Christian, who also served as one of the missionaries our leader sent south to bring in new communal members, was a man one year younger than our leader but wiser and more handsome than our leader had ever been, though Christian’s build was leaner, a sturdy pine beside Father Keil’s oak. The recruits, whom we hoped would eventually convert, were usually people who could advance the colony: wagon makers, farmers, coopers. I wondered if we were contributing to their souls by making them colonists as much as they contributed to our coffers. Sacrilege, such thoughts. My eyes ached from staying open. I refused to blink for fear the lids would overtake me and embarrass me with sleep. Maybe just for a second I could close them. Catherine pursed her lips as I wiped my drooling mouth with the back of my hand, hoping no one else had seen my lapse. Catherine was “too good” and would never sleep in church. Some unseen force moved my eyes to Christian’s. I willed my face to heat no crimson blotches on my cheeks as I looked boldly at him. He stared, his dark hair as silky as a beaver pelt, no part, combed back. Long sideburns rolled up into a mustache thick and trimmed. Dark hair acted as a picture frame for a strong face, straight nose, and eyes as blue as the feathers of a bluewinged teal and just as soft. I sighed despite myself and my mother elbowed me. Had he seen me fall asleep? I hiccupped. My mother frowned. When I saw that Christian let his eyes rest on mine before he eased them toward our leader, I couldn’t control the racing of my heart. This lyrical novel is based on a historical figure of the 1800s: the spirited and intelligent Emma Giesy. Emma achieves her goal of separating her family from the repressive religious community in which she grew up. But unexpected and dire consequences leave her family and her faith struggling to survive.